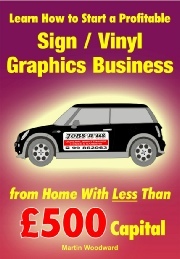 My best selling e-book (paper back also available) shows all the information you need to start your own sign making/vinyl graphics business from home with less than £500 capital. I know this can be done, because I’ve done it twice – here in the UK and in Cyprus - so can you. This is very easy, clean and enjoyable computer based work, ideal for any age, male or female part or full time. A good honest and very profitable business! Forget pie in the sky get rich quick schemes - this works! Unlike most of the other guides/DVDs advertised this was written by me the seller, not simply copied from somewhere else and sold on. As such I am available to answer any queries which may not be in the guide. As and when this occurs I am then able to continually update the information, improving future copies for everyone. ALL IN ALL A GOLDMINE OF INFORMATION AT A BARGAIN PRICE! I used to think I was too old when I was 20. Now that I'm 63 it worries me less. You're never too old. In fact learning something new is good for your marbles! I've lived through 3 serious recessions. It's a cycle, they begin, they end, and the new businesses that emerge when they end ALL NEED SIGNS. And if you operate from home and keep your overheads low as I recommend YOU WILL SURVIVE as I have done for the last goodness knows how long.